Kris Allen is 'Idol' Champ! 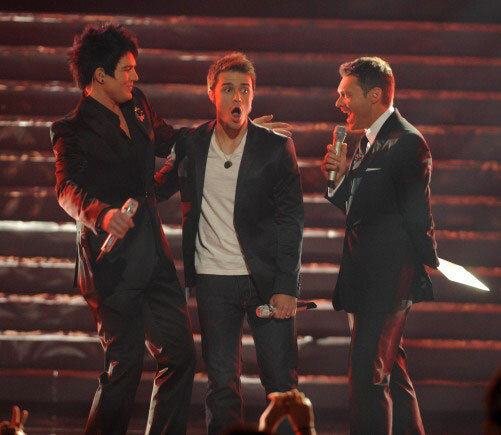 In an upset victory over Adam Lambert, Kris Allen has been crowned the new American Idol! Allen, a 23-year-old Arkansas native, wowed the judges with his rendition of "Ain't No Sunshine" Tuesday night, but never received the kind of praise that the judging panel showered on Adam Lambert, 27. For the judges, the singing battle between Allen and Lambert heated up when Kris proved his star power with a performance of Kanye West's "Heartless." Both of the finalists took the stage Wednesday night with music legends -- Kris performed with Keith Urban, while Adam rocked the stage with KISS. At the top of the show, "Idol" host Ryan Seacrest revealed that over 100 million votes were cast for the contestants -- and a record-breaking 624 million votes were cast during the season! The finale also boasted performances by the Black Eyed Peas, Cyndi Lauper and Keith Urban.